The key to a healthy glow is making sure that your skin is as well-prepped as possible. Keep your skin hydrated with water and a good quality moisturiser, and make sure that you use some sort of SPF to prevent premature ageing. If you’re on the road to healthy skin but you’re not quite there yet, the next best thing is the Daniel Sandler Retexturising Face Primer. The incredibly light serum gel base is colourless and non-oily, and glides over the skin to fill in fine lines and wrinkles effortlessly. The added SPF20 is a godsend, especially for those who find SPF moisturisers a little on the heavy side. When your base is sorted, add a little healthy colour with the Dior Healthy Glow Summer Fluid, a velvety finish skin tint that reflects light and infuses skin with a serene golden glow. Apply with your finger tips for a more natural finish. Top up your golden glow with a swirl of the Dior Healthy Glow Summer Powder, an interwoven harmony of four shades that adds accentuates a sunkissed look. Use the Stila #24 Brush and don’t be too precise about it – just buff on wherever you would naturally catch the sun. 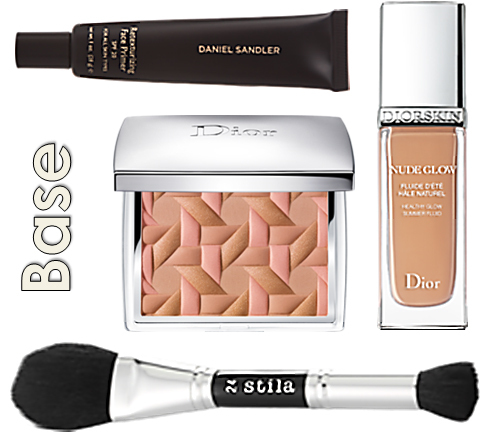 Sculpting and contouring is big news this summer, and the best tool for the job is the Daniel Sandler Watercolour Crème Bronzer. This multiuse wonder instantly creates cheekbones without the mess and fuss of powder, and that’s not even the best part – you can use your fingers! It’s without a doubt my must-have product for the summer months. Accent the tops of your newly acquired cheekbones with the pink shade in the Stila Baked Cheek Duo, and apply with the smaller end of the same Stila #24 Brush as before. 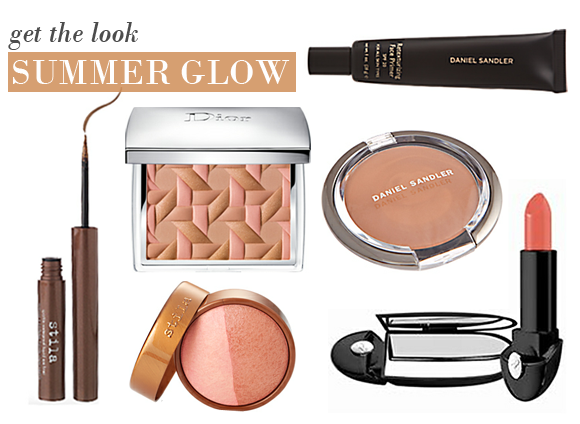 The peachy gold glimmer is the perfect hue for a tanned look! Keep the eyes relatively simple for this look as the lips are set to be pretty bold. Tightline eyes as close as possible to the upper lashline with Stila Sparkle Waterproof Liquid Eye Liner in Rock Candy, a perfect shimmering bronze tone with holographic micro-glitter that makes the eyes look so bright and beautiful. 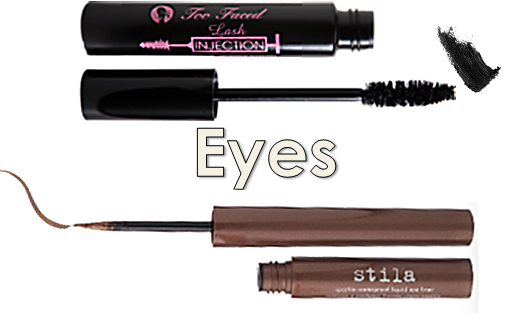 For your lashes, make sure that they are as black, defined, and well curled as possible. Achieve this without an eyelash curler by using a waterproof mascara, as they tend to hold the curl better. The Too Faced Lash Injection Mascara is perfect for the job, with a curling effect, a 3D lash coating technology, and an industrial strength waterproof formulation. Orange hues really accentuate the look of a tan, but don’t despair if you’re not a fan of the brights – there really is an orange option for everyone. If you prefer a fuller coverage, Guerlain Rouge G in Orange Euphorique is perfect. The super shiny pink-orange hue is shot through with subtle golden shimmer for surprisingly soft look that makes the skin glow. If you’re a gloss girl, opt for the brand new Guerlain Terracotta Gloss Sheer and Shine in Mambo. The jellified orange colour is glossy and subtly tinted without a trace of shimmer, making for a super polished look. If you’re truly not a fan of bold colour but would still like the flattering effects of an orange hue, opt for the limited edition Clarins Instant Smooth Crystal Lip Balm in Crystal Coral. 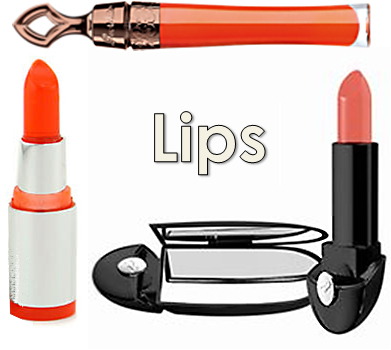 The ultra nourishing balm tints lips with the merest hint of colour, and the orange coral hue is flattering for most. Does give a lovely sheen but not ideal for my combination skin as does not disguise shiny areas like nose and chin. Would prefer a more matifying effect. This entry was posted on Thursday, June 16th, 2011 at 8:00 am and is filed under Get the Look, Hints & Tips, Make-up. You can follow any responses to this entry through the RSS 2.0 feed. You can skip to the end and leave a response. Pinging is currently not allowed.